Everyone’s favorite pie, paleo style. Filled with creamy date paste and overflowing with toasted nuts, this pecan pie (pronounced pee-can my friends, not peh-cahn) will certainly not disappoint at your next dinner party. Top a slice with homemade dairy free ice cream, or coconut whip cream and you’ll definitely want to save this page when sifting through recipes for your Thanksgiving dinner spread. 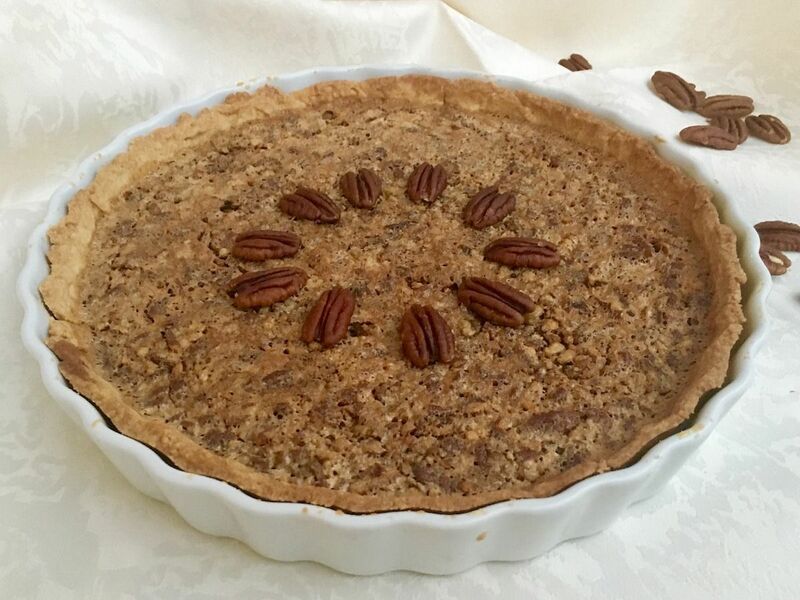 If Pecan Pie isn’t your thing, then leave a comment below of what pie recipe you would like to see posted for your next grain-free holiday spread! Preheat oven to 350F and grease a pie dish with coconut oil. In a food processor combine the almond flour and salt. Add in the egg and coconut oil gradually. Once a dough forms, remove and press into the greased pie dish. Bake at 350F for 10 minutes and then set aside to cool for 10 minutes. Start to make the filling by combining the pecans and spices in a food processor and then adding the dates, coconut oil and almond milk. Pour filling into the cooled pie crust and top with pecan halves (you can get fancy with the design here). Refrigerate for 30-60 mins or until set and enjoy!